All three materials – aluminium, tinplate, and plastic depend on materials that have to be extracted from the earth, processed, and refined to reach their final form. Forests and ecosystems are destroyed, habitats of wildlife lost, and the surrounding areas are left polluted due to toxins released by the mining process. Moreover, production methods involve chemicals and result in toxic by-products. Extraction, production, and transportation of materials all use energy which is predominantly obtained from fossil fuels, leading to the emission of greenhouse gases. Moreover, the raw materials for the three kinds of packaging are imported into Europe involving long distance transportation and therefore more burning of fossil fuels. Thus, it is essential to reduce use of new material through primary production as much as possible to limit further damage and destruction of the environment. 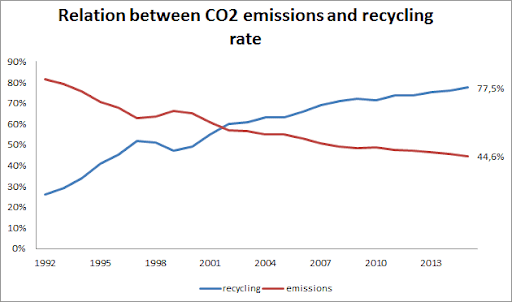 Limits climate change when emissions are decreased. Saves 40% of water during production. In Europe tinplate is the most recycled material. Countries like Netherlands, Belgium, Germany, Switzerland and Spain have achieved more than 90% of steel recovery. This happens thanks to steel’s magnetic properties. When tinplate that is not properly sorted, ends up in residual waste, they are incinerated or undergo mechanical and biological treatment. Here giant magnets are used to recover steel scraps from the waste. Aluminium is produced from bauxite, and its production can be the most energy intensive process of all metals. It is used to make cans and tins for food, paints, cosmetics and other consumables. Saves 95% of the energy needed for producing new primary aluminium. Achieves 97% reduction in carbon emissions, and rates as the least polluting of all materials when recycled. Europe has the highest recycling rates for aluminium in the world. 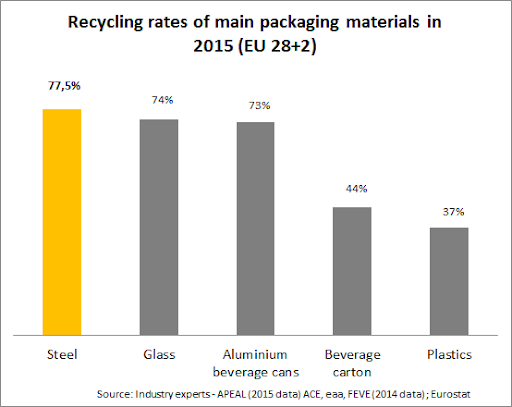 Europe recycles 60% of its aluminium packaging and 90% of aluminium used in construction and automobiles. Aluminium cans recycling is as high 73%. More than 50% of aluminium used by its member countries already comes from secondary sources. Moreover, 89% of the recycled aluminium is treated and recovered in Europe itself, further preventing emissions due to long distance transport. This has the added advantage of creating thousands of local jobs and providing a boost to national economies, as recycling aluminium is a small and medium scaled industry. Not surprisingly it is considered ‘a star of the European Economy’. Waste management remains the major problem with plastic packaging. Less than 30% of plastic packaging is recycled in Europe. Of this 31% ends up in landfills, and 39% is incinerated for energy. Plastic recovery depends on the type of polymer they are made of. PET (Polyethylene Terephthalate), HDPE (High Density Polyethylene) and PP (Polypropylene) are the type of plastic that are most easily recycled. It is possible to recycle PET by chemically recycling it, but it is an expensive process. In Germany, 98% of plastic bottles are recycled, of which only 34% is made into new food-grade PET bottles, and the rest is down-cycled to make products like textiles and tapes etc. Most of HDPE and PP is also down-cycled. Overall in Europe, only 30% of plastic of the recycled plastic packaging is recovered and there is a constant need for primary plastic. Each year 4% of fossil fuels are used as raw materials, and another 4% provide energy for plastic production which in turn adds to climate change, air pollution and production of toxins. In addition, plastic waste ends up in the oceans, and amounts to 80% of the marine litter. Plastic packaging litter has accumulated in the Mediterranean Sea, the Arctic Ocean, and the European Exclusive Economic Zone, affecting tourism, shipping and fisheries. Moreover most of the plastic waste is exported to developing countries for recycling, which occurs in unsafe conditions leading to health problems for people. Millions of marine animals are killed because they consume plastic and micro plastics. Nearly 700 marine species, many of which are endangered and complete habitats are getting decimated due to plastics. Harmful chemicals such as bisphenol A (BPA), a carcinogen, and bisphenol S (BPS) or bisphenol F (BPF), can be leached into landfills and oceans that can kill animals and also be deleterious for people. There are hidden environmental, social and economic costs to using plastic. In short, using recycled metals like aluminium and tinplate is the economically viable and environmentally friendly option. Considering that these materials show no loss of their original properties, the choice of recycled aluminium and tinplate over plastic packages is an easy one. Pongrácz, Eva. (2007). The Environmental Impacts of Packaging. Environmentally Conscious Materials and Chemicals Processing. 237 - 278. 10.1002/9780470168219.ch9. Bio Intelligence Service, GHK (2006). Annex 7. A study to examine the benefits of the End of Life Vehicles Directive and the costs and benefits of a revision of the 2015 targets for recycling, re-use and recovery under the ELV Directive. Report prepared for European Commission Environment Directorate-General. Plastic waste in the marine environment: A review of sources, occurrence and effects, Science of The Total Environment, Volumes 566–567, 2016, Pages 333-349, ISSN 0048-9697, https://doi.org/10.1016/j.scitotenv.2016.05.084.